Gattina is hosting this week's Fun Monday...and well she wanted to know what I call...messy place! Gosh...Gattina you are forcing me to reveal my not so good side! Ha ha ha! Okay...modesty set aside...my room is neat and always in place. And that is because I have a very organized Mom! It has nothing to do with me. So here is my working dresser...this is an old dresser of mine, got this since I was 9 I guess. As you can see I have there my cheating lotion, ummm...I mean natural glow thingy...yah know when I'm to run out the door and remember I wanted some tint in my legs! Then you have my perfume...the heart shaped. 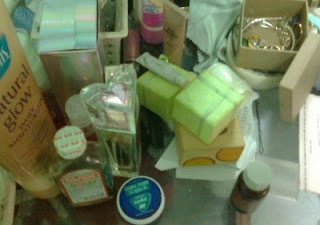 Though I have my place for them, that shows it's my recent scent because it's there. I guess I used it last night. Then you have the mint oils and Vicks Vaporub...I use them in between sleep...sometimes. Then are some lip gloss...and my small box where I just toss jewelry I just used...so they stay there before I put them back to the jewelry box, unless I decide to wear them again the next day. 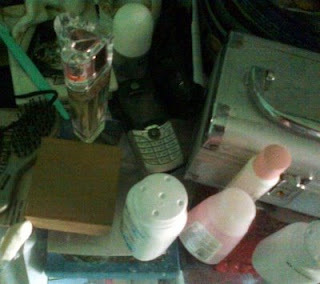 This is the other side of the dresser...you have there my facial astringent and moisturizer. Loose powder of the nephew...another cellphone...and other things which mess it up! I think that is the only messy part of my bedroom...but let me take you to that special room I had them built for my stuff. 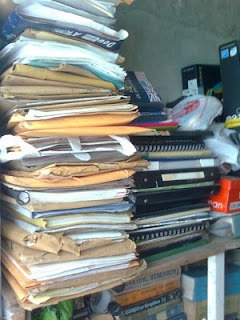 I have so many papers...most of them are my works so I can't just throw them way. I still have to review them and arrange them. They've been there since we move here about 2 years ago! 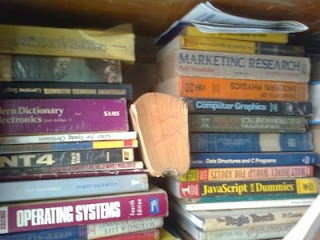 Other books which I still have to re-arrange, labeled and add to my "library" at home. Wish you all a happy Monday! There is nothing to do, lol even your "mess" looks organized especially the papers and books. 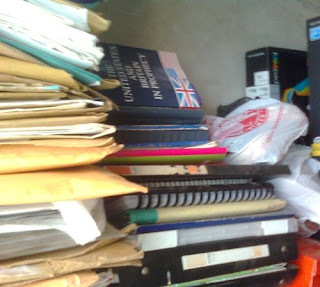 It's amazing that the folder "tower" keeps standing, lol with me everything would be on the floor ! It looks like you are a hard working student. Mess equals interesting. Tidy equals boring. LOL mess looks totally organised! Do you have OCD? Just askin'? Mariposa, your mess is organized in your own way...you know where everything is. You have a place to put these things after you use them. Thanks for sharing and Happy FM! You MUST be a genius!! My father is, and his office looks just like yours!! Oh Mariposa--you're such a girley girl! I love all your little beauty secrets. So Natural Glow is the best fake tan? I also spritz on perfume at night--even though there's no IT guy here! :-) As for the "work" side of your mess--you just need a few long nights of the winter to sort out. May not be possible in your part of the world? BTW, tell me what you think about North and South whenever you get a chance to see it. That looks a lot like my hubby's study and I'm determined that it will get tidied this coming winter. Well, at least you have neatly piled the papers so that you can "see" where everything is.